Webmail Smackdown: Which Is Best? Which Webmail Service is Tops? Google Mail, commonly called Gmail, is the gold standard in Webmail. In my opinion, nobody does it better, or with greater thought for users’ convenience and protection. More than half a billion other Gmail users agree. For instance, if you use the word “attachment” in an email’s subject line but no file is attached to the message, Gmail will ask you, “Did you forget to attach a file?” Gmail’s spam filter is the best in the business. Its filtering and search features are incomparable. Gmail Labs, a set of optional and experimental features that can be enabled, include Canned Responses, custom keyboard shortcuts, a Preview Pane, Undo Send, and other nifty features. The most popular Labs tend to get rolled into the Gmail base code. There's also a rich assortment of third-party addons for Gmail, including Rapportive (displays info about people you're emailing), SaneBox (keeps folders organized), and Boomerang (schedule messages to be sent later, and check for replies). On the downside, Gmail is ad-supported and the targeting of ads is often way off the mark. But it’s free, and you can store up to 15 GB worth of email. I've been using Gmail since 2004, and only recently hit the 15GB mark. I'm sure I could find and delete 5 or 10GB of useless attachments, but instead I opted to pay $5/year for an additional 20GB of storage that can be shared across Gmail, Google Drive and Google Photos. Microsoft's Outlook.com, formerly Hotmail: Leave it to Microsoft to confuse everyone by naming its Webmail service after the POP3 email client (and personal organizer) program included with its Office suite of productivity tools. The Hotmail name was a total loss; it became synonymous with spam, security breaches, and user cluelessness. Renaming it after the most widely used business productivity suite is supposed to restore respectability to Microsoft’s Webmail service. About 250 million people actively use Outlook.com. Storage space is “unlimited” in Outlook.com, the final trump in this ultimately irrelevant game of one-upmanship. Also, email attachments as large as 300 MB are possible using the integrated Sky Drive cloud storage service, whereas Gmail attachments are limited to 25 MB. Skype, Calendar, and the People contact manager are also integrated into Outlook.com, making the Webmail service feel and behave much like the desktop Outlook so familiar to corporate workers and solo professionals. AOL Mail, also known as Granny’s Mail: Amazingly, AOL Mail is still among the top five most-used Webmail services despite its (perhaps unfair) reputation as something only clueless people use. AOL pretty much ruled the Internet back in the mid to late 1990s, and I suppose there are plenty of people who just don't want to switch, or hassle with changing their email address. AOL Mail has been modernized from its 1990s look, and spam filtering is pretty good, but it still lacks so many features that it’s just terrible for anyone who has used Gmail, Outlook.com, or even Ymail. For instance, there is no notification that you have received new mail; that’s staggering considering that AOL’s TV commercial tagline used to be “You’ve Got Mail!” They do offer the option to forward all your mail to a new address, which might be the most useful feature of all. Hushmail is a significantly different Webmail service: ad-free, unlimited email aliases, and that increasingly scarce commodity, privacy. Email is stored in encrypted form and Hushmail does not have the keys, so even a government subpoena will not force the company to produce your private correspondence. Privacy costs money: $49.98 per year gets you 10 GB of storage, Web and POP/IMAP access, unlimited email aliases & dedicated technical support, and no advertising. 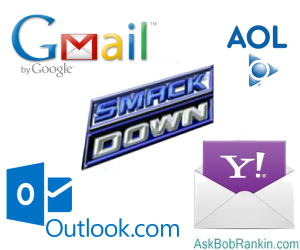 Most recent comments on "Webmail Smackdown: Which Is Best?" Since Google is known to data mine address books, emails, and documents for their own use, they would be the last service I would use. I know we don't care about privacy these days, but I do care that Google could sell information about people unfortunate enough to send me an email because they are trapped in Google's honeypot. I think I'll look into the service that has some small respect for privacy. Understand I'm not cheerleading for Google here. Gmail will forward all your (non-spam) emails to any other ID you give it. I prefer the AOL Desktop email handler as it has features found nowhere else. In my inbox or spambox, I can sort on date, userid, or subject. I can also select those emails containing any search key(s). For someone geting lots of emails, this ability allow fast selection and/or deletion. Call it granny mail or anything else, short of writing my own email program, I've found NONE as flexible as AOL's Desktop handler. & it's ads? Easily covered by the mailbox and address book. I have been using Windows Live Mail, and am happy with it. Since I use Windows 7 and lost using Outlook Express, I am still missing it. Outlook Express is in my opinion the easiest and best application you can use. And I am still looking for a replacement. There is a replacement, which you can buy for $99-00 and is made for Windows 7. But it is to expensive to buy. I've got email addresses with hotmail/outlook, gmail, and yahoo. I've never cared for the feel of gmail, and I use it rarely, because I actually get a lot more spam there than I do in my hotmail account. I used yahoo for awhile, but started getting a lot of posts from friends whose email accounts had been harvested for spam. Bunches of them. I've tried recently to call Yahoo for some problems with my email, but I was put on hold waiting for a representative for 15 minutes (yes, I was actually watching the clock), no one ever came on the line, and then the call just dropped. This happened twice. As for hotmail: I hated it when they converted hotmail to the new outlook, but I'm slowly making peace with it. And last of all, there used to be a free web based email a few years ago called bigstring that would allow you to even delete one of your previous messages from a recipient's mailbox. I don't think they are still operating, but I would love to find a service that can tell me when a message is read. Does anyone know of a good web based email with this ability? Only anyone who has absolutely no concern for their privacy whatsoever would even consider using gmail. They are notorious for spying. To grant them access to my private e-mails would be ludicrous. I'll stick with what has always been the best, MSN mail. We have been using AOL for email since we first got a computer back in the days of Windows 98. We now have Windows 7 in our Asus desktop we bought in 2011, and are still using AOL as our main browser and email. We like AOL for email as it is intuitive to use, and find that works fine for us. Like a couple of others, I'm extremely ancient and still use the venerable desktop app: Thunderbird. When I want to check my email, I don't use my cell phone or Ipod or anything else, I use my desktop computer, and in the 10 years I've been using Thunderbird, it's never given me a bit of trouble. I've stored at least several Gigabytes of emails, can sort and delete them easily, and the whole thing backs up very nicely using Mozbackup, a third party freeware. Besides which, I don't need the hassle of changing my email address. Love it. My Yahoo mail has been seriously slow for the past year, so slow that I refer everyone to my hotmail acct. Also my computer.After reading Bob's post re; changing to Yahoo.com I decided to delete it. Voila! The bonus is my computer this morning stunned me at the speed with which it booted up and when I open I.E. it's just there. Oh, I know this cannot have anything to with my previously mentioned actions, however it leaves me curious as to what has taken place. And yep I have hotmail, and xp. No hope for me, eh?. Best regards. john. I have used Yahoo, Gmail and Hotmail for very limited purposes, especially if I didn't want particular entities or groups from knowing my "real" (ISP-provided) e-mail address. I still prefer to receive my "real" e-mail in Outlook on my desktop computer. I feel like I have a lot more control over what goes where and make extensive use of the rules feature. I make extensive use of the calendar as well. Also the interface doesn't change unexpectedly--I would have to upgrade to a newer version for that to happen, and obviously I would know it was going to occur! Even technically-oriented people do not like sudden changes foisted on them, and less technically gifted people are often at sea. Outlook.com may be an improvement as regards spam, but it is almost universally disliked by everyone I know that is/was a regular hotmail user. The new interface made it difficult for some of my older relatives to figure out how to do simple things like send or forward e-mail! If you run into problems free on-line e-mail accounts don't give a lot of personalized help--you get what you pay for! I was gonna ask you to speak about GMX & their 50mb attachment feature, but didn't know about Outlook's 300mb option. I have a Hotmail Address as a paid account and also livemail with my hotmail address. I also have a paid Yahoo account grandfathered. I also have gmail, which is neccessary if you have a smart phone and want to transfer all your google info to it. I also use AOL and my ISP email. All are forwarded to my Hotmail and livemail account. I do not use hotmail or livemail on my cell phone,I get at least 50 or so emails per day, but do on my tablets.does anyone remember when gmail first came out you needed an invitation from a user to sign up for gmail? This Granny has been using AOL since 1992, when I paid for it. I have Yahoo, Comcast and Gmail addresses, but I like AOL the best. It reflects my hobby, and is easy to remember, too. GMail does allow to send larger email attachments through Google Drive. Thanks for all the great informative articles. When I bought my first coI stayed with them until I switched to AT&T in 2012. I used earthlink mail for all my personal email and gmail for news and shopping. I liked many features that earthlink had, like sorting by columns, but it had the smallest cloud storage limit, maybe 1 gig; so I used Mozilla, then Thunderbird to store most on my desktop. When I switched to AT}&T in 2012 and had to pay to keep my earthlink email address, I finally opened a second gmail account to link and save all my earthlink saved messages. The hardest part was contacting everyone to stop using my earthlink email address and to start using the new one. AOL Mail does not offer an option to forward all your mail to a new address. May I add safe-mail.net to your list of email clients? It's very secure (better than Hushmail, imho, and doesn't require log-in every 3 weeks to keep your account free), with various user options for the level of security desired. With its (small) Symphony download icon on your task bar, your inbox is only a click away. I'd also add tor mail to your list, though that does require downloading the Tor browser (for max security). answers your search for a safe & fully versatile webmail you can see when your emails received: safe-mail.net (out of Israel/UK/Japan) not requiring opening browser to do a lot of email functions, with free trial to take for a spin, and easy upgrades. But in response to USGov NSA PRZM Snowdon Gmail scandal now inclusive of Firefox & AOL too, crowdfunding wrought Swiss global Protonmail uniquely encrypted by you BEFORE ARRIVING AT YOUR INTERNET SERVICE PROVIDER so your ISP really can't get into your business no matter how pressured by govt; & their servers 1000 feet under granite protect even from nuke disaster! Security is the best for anyone because many organizations and company our conversation through email and other social sites. But it is not secure.